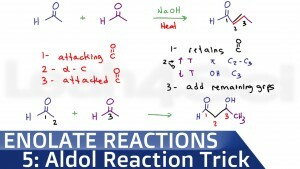 Aldol reaction mechanisms are long and tedious! Once you’ve mastered the aldol addition/condensation mechanism you need a faster way to predict products. You also need to be able to identify starting molecules from a given product. This video shows you my 1-2-3 trick for quickly identifying aldol condensation products as well as using the products to identify starting aldehydes and ketones.